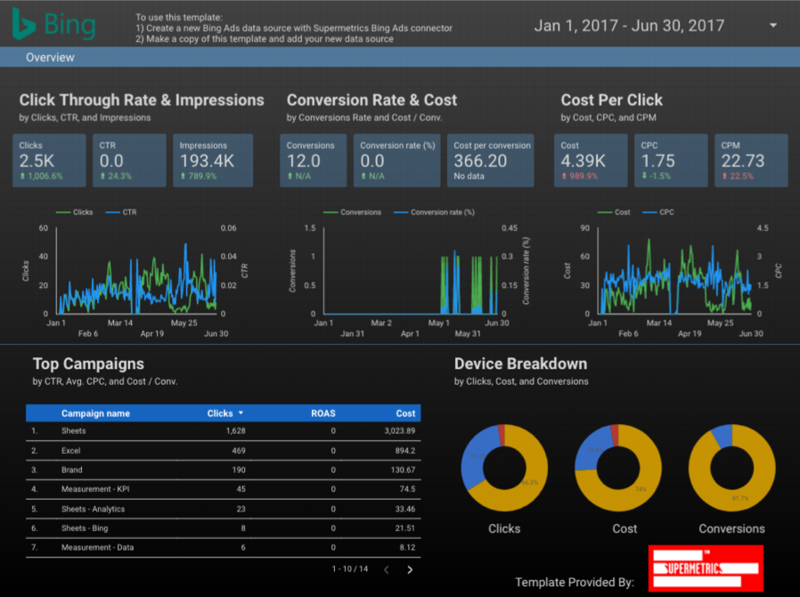 DATA STUDIO CONNECTORS · 8-MINUTE READ · By Supermetrics on September 7 2017. 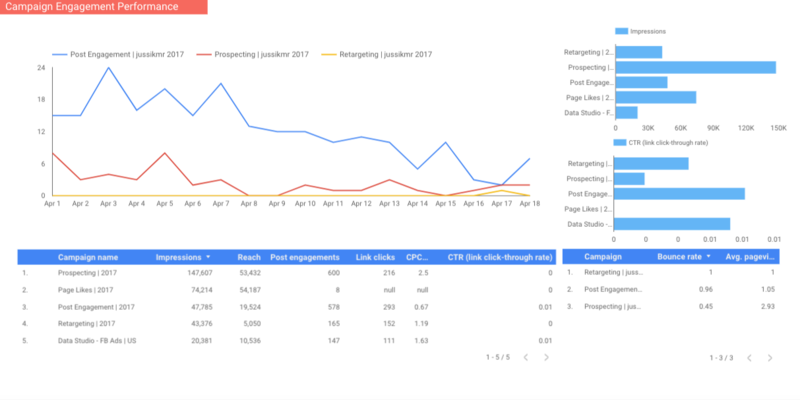 If you want to use Google Data Studio for reporting, your life just got a lot easier. We are extremely thrilled to announce our native Data Studio connectors that directly pull all your marketing data into Data Studio! 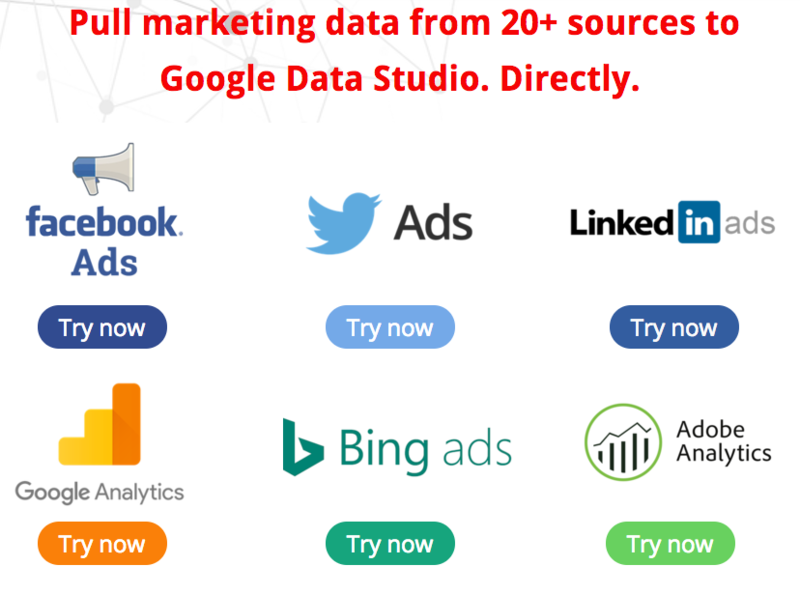 Now you can fetch data from Facebook, Twitter, Linkedin, Bing and 20+ other marketing platforms into Data Studio without the need to use Google Sheets as a workaround. This article will tell you about the benefits of our connectors, provide step-by-step instructions on how to use them and feature several reporting templates that will help you save a great deal of time. Without further delay, let’s dive in! Why Supermetrics Connectors for Data Studio? 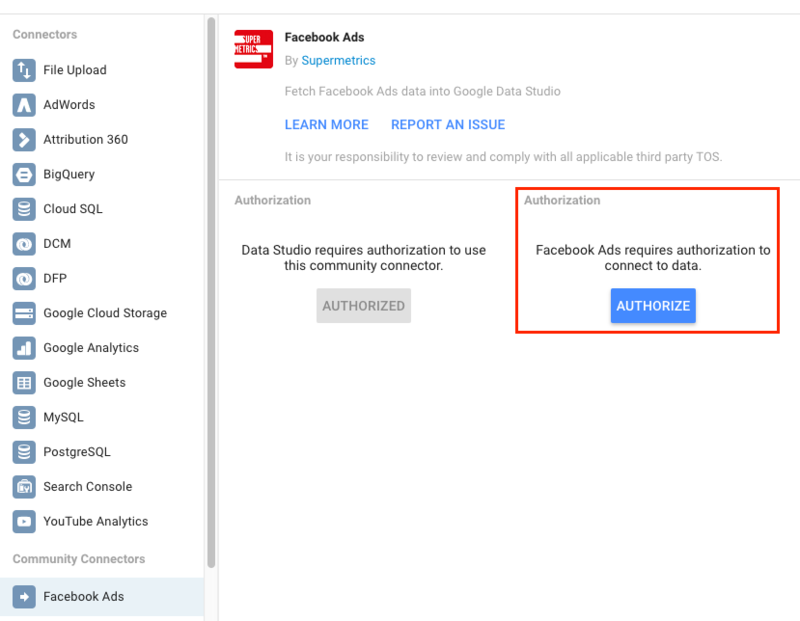 In our previous Data Studio series, which went viral, we covered how to report Facebook Ads and other non-Google data in Data Studio, and how to blend data from multiple sources. But this was all done via Google Sheets. Let’s face it. Using Google Sheets as a workaround is great, but not perfect. Firstly, it takes time to gather all your data in Google Sheets before importing it to Data Studio. As well, you need to know the small details to pay attention to in order to successfully build Data Studio reports. For example, if you want to pull date and time values from Sheets to Data Studio, you have to make sure the date/time formats are compatible with Data-Studio – otherwise they will be shown as text in Data Studio. All of our connectors allow you to pull and blend data from multiple accounts of the same source. Let’s say you’re a marketing agency with an AdWords account for each client, and you want to get data from all the accounts into the same report to monitor spend and performance. 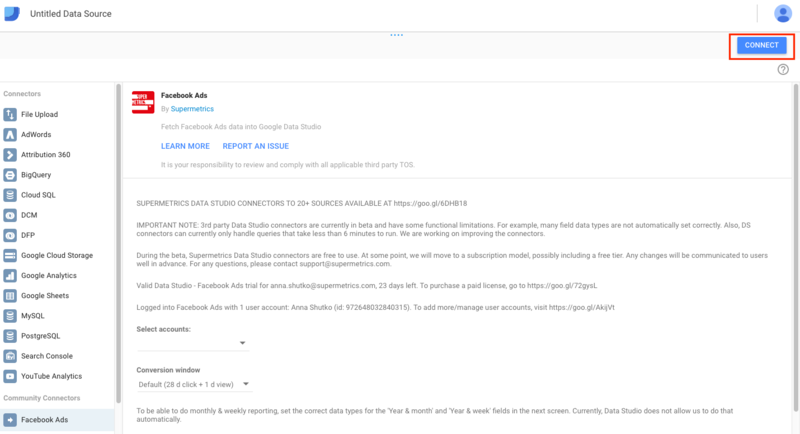 With our AdWords connector, you simply need to select all the accounts when creating a data source in Data Studio. With our new connectors, you can directly pull paid and organic traffic data from the biggest social networks. Apart from Facebook, Twitter and LinkedIn, we also cover Instagram, Tumblr, Vimeo, Pinterest and Reddit. With our Google Analytics connector, you can easily select the one or many Google Analytics views and segments you want to report on – just select all the relevant ones in the drop-down menus. Data sampling in Google Analytics is a disturbing issue with reporting on long time frames or large sites. However, not anymore – you can avoid sampling and get more reliable data into your reports simply by choosing “Try to avoid sampling” option in our connector’s menu. 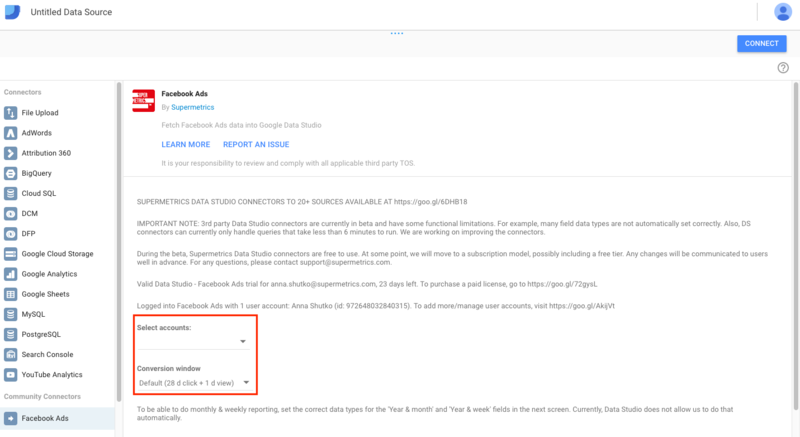 Please note that the “Data Control” option, which lets you switch between your Google Analytics views, currently does not work because Google has yet to make “Data Control” work with 3rd-party connectors. Compare the performance of the competing paid search networks side by side, using our AdWords connector and Bing Ads connector. A unique feature offered by our AdWords connector is reporting Historical Quality Score, a metric important for every marketer to analyze and monitor. Among the display networks, we currently cover DoubleClick, Yahoo Gemini and Adform, with more to come. In addition to the abovementioned connectors, we also offer Adobe Analytics, MailChimp, Google Search Console and Moz, just to name a few. What’s the best parts of our Data Studio connectors? They’re extremely easy to use! Go to our Data Studio connector gallery and choose the connector you want to try. Next, click the blue “AUTHORIZE” button to log into the data source. Then, Supermetrics’ authorization window should appear. Follow the instructions to log into the data source. Next, select the accounts you would like to report on from the drop-down menu. After that, configure other options if applicable, for example choosing Segments in the Google Analytics connector or Conversion window in the Facebook Ads connector. Finally, hit the “Connect” button in the top right corner to get the data to your Data Studio report. Our connectors come with an additional sweet bonus: a collection of reporting templates for free. Now you don’t have to create reports from the scratch; choose the report you like, make a copy and connect to your own accounts with a few clicks. The gallery is growing, with new connectors being added. Make sure you follow us on Twitter so you won’t miss our new reporting templates! 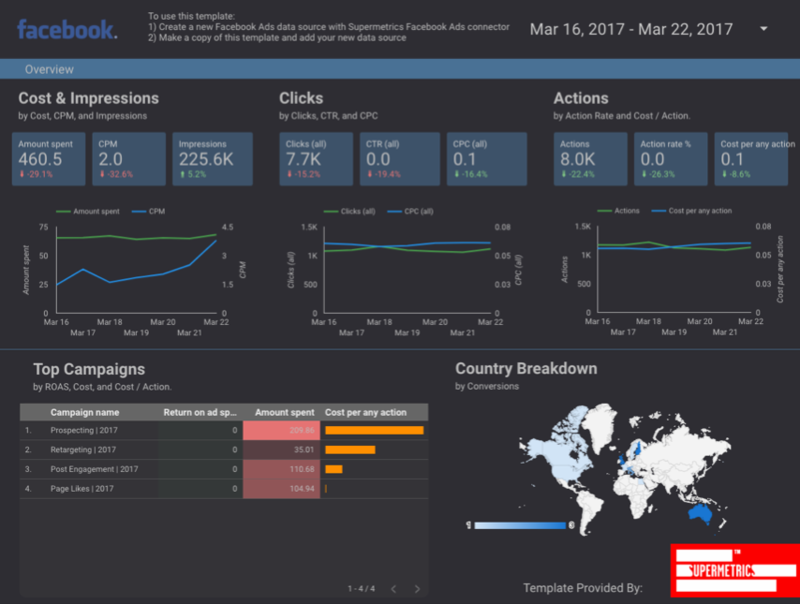 Data Studio is a game changer for reporting and visualizing PPC, SEO, social, analytics and other online marketing data. Our connectors help unleash Data Studio’s full potential by connecting Facebook, Twitter, Linkedin, Bing and other non-Google platforms. There is no better way to learn the power of Data Studio than trying it out yourself. Go to our connector gallery, give it a spin and let us know what you think.